The precise location of Scone Abbey had long remained a mystery, but in July 2007 archaeologists pinpointed the location using Ground Penetrating Radar (GPR) technology, the Abbey’s structure was revealed to be larger than had been imagined and the exact location was found to be in what is now a garden area in front of Scone Palace and Moot Hill. 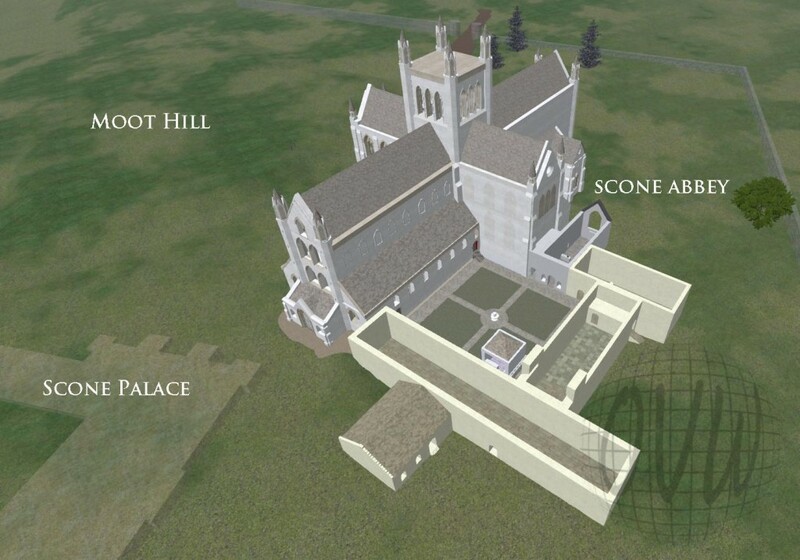 Using the data gathered by archaeologist Oliver O’Grady and working with historical experts Prof Richard Fawcett and Prof Richard Oram we created a 3D virtual model to help us better understand the Scone Abbey site. From a sketch by Prof Richard Fawcett to our 3D representation. Using the scale and layout from the archaeological dig, creating a 2D sketch and then a 3D model we gain a better understanding of how the Abbey would have looked. Founded between 1114 and 1122 Scone Abbey was a house of Augustinian canons located in Scone, Perthshire, Scotland. Originally named Scone Priory, its status was increased in 1163/64 to Scone Abbey. The abbey had important royal functions, being next to the coronation site of Scottish kings at Moot Hill and housing the Stone of Destiny (until it was taken away by King Edward I of England). Scone Abbey was, in the words of King Máel Coluim IV, “the principal seat of our kingdom”, and as such, the abbey buildings surrounding the cloister, would be residences of the Scottish kings. In 1559 Scone Abbey was destroyed by a mob from Dundee in the early days of the Reformation. This is an ongoing project, working towards gaining a better understanding of this significant Scottish site.